Today I am covering tip number 4 of 5 on things you can be doing to help ease your heel pain. Check out our blog to find more tips. It is really quite simple for you to stretch your calf. Stand about 50 cm from a wall or door. Place the leg not to be stretched forward and bend the front knee. 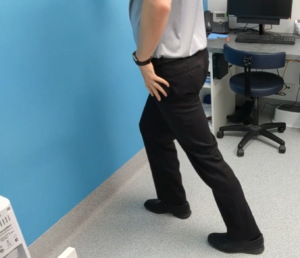 Keep the back leg straight and lunge toward the wall (like in the photo above). Press your hips toward the wall to fill a stretch in your calf area. Hold the stretch for 30 seconds, relax, and then repeat twice more. Doing this at least three times a day is key to making a change in the muscle. So get in and start stretching our your calf muscles. Combining this with the other exercises and changes will start to improve you pain. Now as with any exercise, if you feel that it doesn’t feel right or is making the area sore, stop the exercise immediately. If this happens to you, it is time seek our help to diagnose the condition correctly and provide the right treatment plan. Keep an eye out for next weeks blog which will be covering how to rest the area and the role orthotics can play. This entry was posted in Blog Posts on December 9, 2018 by Feetology.